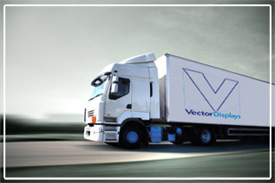 Vector Displays provides trade show project management to our clients. Contact us if your company needs a comprehensive set of services for handling exhibit properties and client exhibit programs. Our model is unique and designed for efficiency and cost effectiveness in order to help our clients maximize their investments at trade shows, exhibitions, and events. Typical offerings include property storage, handling, site supervision, turnkey show services management, exhibit planning, and exhibit management. As your trade show, exhibition, or event partner, we seek your constant feedback and approval as detailed exhibit and graphics solutions are designed and during any construction, fabrication, and exhibit remodeling. Why should I use Vector Displays for my trade show project management program? If you are looking for a turnkey solution for your exhibits and trade show schedule management, we are the solution. You will be able to devote your time andenergy to ensuring that the results of your trade show experiences are profitable and effective, instead of spending time on the physical aspectsof your booth. Why should we contract out our trade show project management instead of doing this work in-house? Most clients who useour trade show project management program simply find they that do not have enough time to do their regular jobs plus manage the details oftheir trade show or exhibit program. They find they either neglect their regular work around trade show time or do not pay enough attentionto the details of their trade show program. Often they find they arrive at a show, exhibition, or event and either do without somethingthey need or overpay to get it on short notice. With the Vector Displays trade show project management system, we take care of the detailsof your trade show or events program and do it at a fraction of thecost it would cost of working with in-house staff. In addition, many of our clients tell us they appreciate out independent perspective on their trade show or events program's needs. We can offer suggestions based onour industry experience that is both important and valuable to improve your trade show, exhibition, or events program.